Geno Auriemma presumably began Selection Monday with a little too much coffee in his cup. The University of Connecticut head coach spoke at the Middlesex County Chamber of Commerce breakfast Monday morning less than 12 hours before the women’s NCAA tournament bracket release. Auriemma, in his 34th season coaching UConn, hit some strong notes, as reported by Hartford Courant beat writer Kelli Stacy. The main streak will almost surely be intact by the time the women’s bracket is unveiled Monday night. UConn, ranked second in the AP Poll, is expected to get a No. 1 seed for the 13th consecutive year despite a season that fell below recent Huskies standards. No. 2 ranked UConn (31-2) went a perfect 16-0 in the American Athletic Conference (AAC) schedule and won the tournament, yet the 11-time national champions didn’t put up a blemish-free season. The last time the Huskies lost a regular season game was in the fall of 2014 when they dropped their second game of the season in overtime to Stanford. The last time they lost more than one regular season game was in the 2012-13 season. UConn went 35-4 to start a streak of four consecutive titles. Three of the losses were to Notre Dame, including a three-overtime battle and a loss in the Big East championship. Auriemma told the crowd he thinks this year’s bracket is one of the more unpredictable ones he’s experienced. In the women’s bracket, the top four teams in each regional host first- and second-round games. The regional semifinals and finals are hosted at four pre-determined sites set years in advance after the NCAA goes over bids. The tournament selection committee places the overall No. 1 seed in the bracket closest to home and continues through the next three top seeds. For UConn that has meant an easy two-hour drive to the Times Union Center in Albany, New York. The site hosted in 2015 and 2018, will host this month and won the bid for 2021 as well. It’s also meant a 90-minute drive to Bridgeport, Connecticut, in 2013, ‘16 and ‘17. For what it’s worth, last year Louisville also played close to home at Rupp Arena in Lexington, Kentucky. The other two top seeds did not. Mississippi State played its regional 10 hours away in Kansas City, Missouri, while Notre Dame had to travel nearly 2,000 miles to Spokane, Washington. It’s a huge benefit to play close to home and fans have ragged for years on the Huskies for it even though that’s an aspect of the tournament and has nothing to do with UConn. Auriemma made that clear in a semi-rant. “If we win the first two games, we’re going to Albany, right? People are out there [complaining] that we always go to Albany. Well, then tell somebody else to freaking bid on it. Like it’s our fault? People are [complaining], ‘They go to Albany every year.’ Well, guess what? We’ve been the No. 1 seed in the country the last 11 years. Where the hell else are you going to put us? It’s unbelievable. 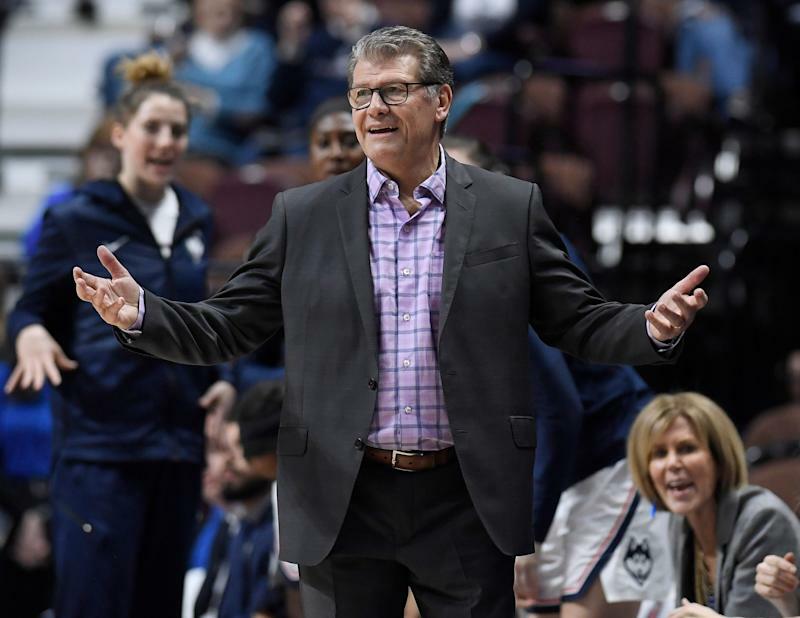 TLDR: it’s not UConn’s fault it doesn’t have to travel far for the regional, but if the NCAA wants to put it somewhere else, Auriemma is confident his team will win. Auriemma has been doing this long enough he knows what to say and how to play it. He spoke about the importance of communication, especially in today’s age, and gave this gem that seems to indicate players are more apt to text than talk. Geno: "Yesterday I said 'What happened on that possession?' And they just looked at me and stared. I go 'No, this isn't a trick question, what happened?' ... I said 'Well, you could text me. FYI, BTW, you should've called the screen.'" The selection show for the 64-team bracket is Monday night. The ensuing anger over UConn playing in Albany will resume shortly.